NEW YORK, Sep 8, 2012/ — It is always a pleasure seeing a collection from Maison Martin Margiela. And for this season, the label’s youthful line MM6 Maison Martin Margiela made its debut in New York for its Spring 2013 collection. 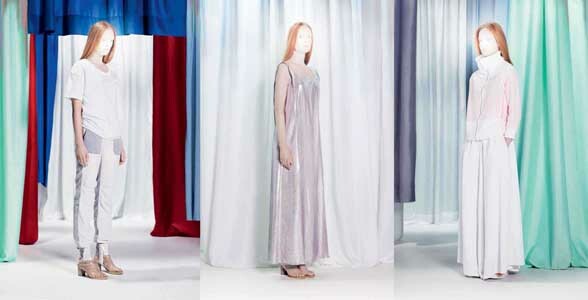 The house of Martin Margiela is well known of being experimental. And the house founder’s legacy lives on with MM6 as the label proposed draped and constructed volumes. Deconstructing the well-known military elements like the parachute, it was re-interpreted into bonded silks and turned-up hems and criss-crossed drawstrings, thus at first glance, it is hard to figure out what the original inspiration was. To the fans of Maison Martin Margiela, that comes as no surprise; and to the un-initiated, they become instant fans. So, hooray for MM6 Maison Martin Margiela! It is a sight for sore eyes in a time when most designers are being conservative because the great recession has never left us.